This is just a fabulous book! I have not read a more interesting, concise, and Catholic life of a saint. Honestly. I marvel that such an edifying book could be written in these days. Here's a bit of the story. Saint Fernando III was born in the Castilian kingdom of what we would now call Spain. He continued the noble Reconquest of his kingdom in the line of the legendary Rodrigo, El Cid and his own grandfather Alfonso who began a most successful campaign against the Moslem invaders. The author, James Fitzhenry uses many excellent sources to recount for us what a giant effort the Reconquest must have been. We had had no idea of the astonishing miracles that God granted to these men, the distances they traveled, the terrain, and the deceits they suffered in their heroic attachment to their duties of state. King St. Fernando, especially, did all for the love of God which is what all of the Roman Catholic saints did by the time they died. His heroic and focused love of God set him above all around him. In the end, we know him as an incorrupt saint whose body can still be seen in the Cathedral of Seville! Incorrupt. I rejoice to know that this story is so true. This is the best book for any Catholic home school curriculum, especially for a high school history of Catholic Spain. Both boys and girls will benefit by reading not only King Fernando's virtues, but by reading about the virtues of his grandfather, mother, lovely wife; and after her death, his second lovely wife. This is the real life story of real kings and queens, good and evil, life and death. Real kings and queens who were real Catholics and real Catholic. Many teachers and parents search for good Catholic books for boys. Start right here with Saint Fernando. Both ladies and gentlemen, boys and girls will appreciate this fast action story of this Catholic king, a true Catholic king and Catholic knight. This is a very edifying book and it is told from a historical perspective that does not stoop to false chivalry, made up discussions, the denigration of women, or long detailed stories of debauchery. James Fitzhenry gives a detailed history of Castile and Leon as he begins his to set the stage for those of us who are not familiar with an integral Catholic life. He also gives glorious descriptions of the battles as noted by contemporaries and panoramic descriptions of the geography of Spain. If you liked his book El Cid, you'll love this one. It's better. Why Is Spain Mostly Catholic? Did you ever wonder why Spain is mostly Catholic? This book has excellent pictures of his incorrupt body and answers this question well. Early Castilian and Leonese Catholics prayed for a strong Catholic Faith and the means necessary to fight away an immense army of Moslems who would destroy that Faith. God answered their prayers with many great victories and astonishing miracles and Saint Fernando III had the greatest of these. I have never read such a good description of what it took to "lay siege" to a city as James Fitzhenry gives. Exhausting! I know have a very good idea of what a siege is and how powerful it is. 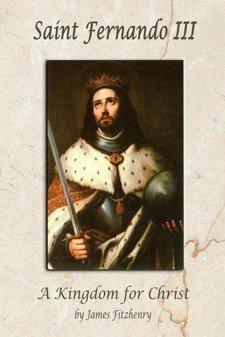 I had never heard of the swift and powerful manner in which Saint James the Apostle and heavenly hosts defended the Castilian armies, time after time, before I read this book. I am grateful that Mr. Fitzhenry did so much research and wrote so well and that Lepanto Press put it in such a beautiful hard bound edition. If you are named Fernando or Ferdinand or know someone who is so named they might be interested to know that Fernando is a Spanish name that means adventurer or courageous. The name is popular because Saint Ferdinand of Castile (13th century) was a great Catholic king of Castile and Leon. The name Ferdinand is of Germanic and Visigothic origin and is made from the words that mean prepared, protection, safety and journey, boldness. According to Visigothic tradition it means "ardent for peace." which fits our Catholic Saint Fernando III perfectly. He greatly desired the Christian peace of his nation and fought heroically to secure that peace. He was also one who lead a saintly life from his youth. This biography of Saint Fernando III makes an excellent gift for his namesakes and those looking for boys' Confirmation names. Ferdinand III of the Kingdom of Castile and Leon was born in 1199 and died in 1252. He became king of Castile in 1217 and of Leon in 1230. His grandfather Alfonso VIII began the most successful campaign to restore his Catholic kingdom against Moslem occupation and Fernando consolidated the Reconquista in his own time. In 1231, he permanently united Castile and León as one kingdom later to become the unified country of Spain. Saint Fernando is the greatest of the kings of Castile in terms of what Catholic Spain owes to him in the Reconquest. It would be over 200 years after his death that King Ferdinand and Queen Isabella of Castile would finish the Reconquest and support Christopher Columbus in his colonizing and missionary efforts in the Americas. He was canonized in 1671. In Spanish, his name is Fernando el Santo, San Fernando or San Fernando Rey. He is the patron saint of the city of San Fernando, the San Fernando Cathedral in San Antonio, Texas and the mission San Fernando Rey in the Los Angeles area of California. Buy Saint Fernando III as both new or used, hard back and soft back for your Texas and California fans. It is so great to read a book about saints living together! Even though Saint Fernando's mother and wife were not canonized they were very holy and always ready to do what God wanted! St. Fernando was such a great saint who just did what he was supposed to do even when it was hard. Did you know that in Catholic Spain there were Catholic Kings trying to provoke other catholic Kings into fighting them when they should have been helping the one, who they were attacking, to fight the Moors? I find it so amazing that after as long and hard as so many Spaniards fought to get the Muslims out of their country and the many men who died for this, they now just let them in through the front door and don't do any thing about it! I think this is a great book that every one should read! It is gripping, exciting, truly Catholic and a book that will teach you how to be come a saint! It is also a great history book. I never understood what a siege was or many of the other methods of war fare that they used during the Middle Ages. The way our text books taught about these wars always used to make me think "Those hatefull barbarians!" I have a different opinion now! St. Fernando, Pray For Us! See more Catholic Saints here.